On August 15, Orthodox Christians and Catholics celebrate the church feast of the Dormition of the Theotokos - one of the 12 major Christian holidays. 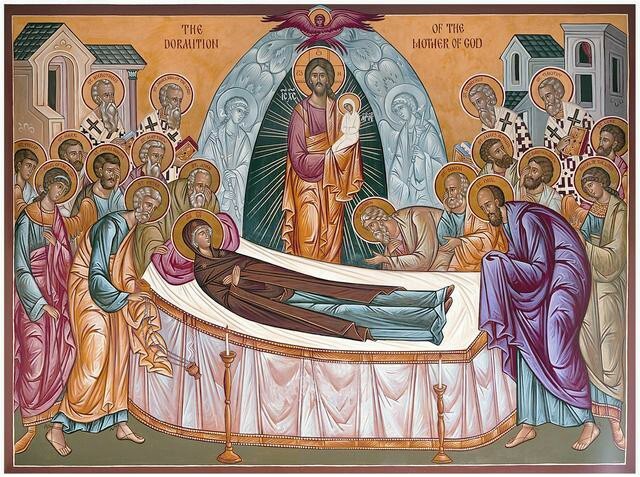 On August 15, Orthodox Christians and Catholics celebrate the church feast of the Dormition of the Theotokos - one of the 12 major Christian holidays. Name Day have all who wear the blessed name of Mary and deriving therefrom Mara, Mariana, Mariana, Marian and Marian. The celebration Virgin Mary is celebrated with a solemn mass in the church. Sanctifying ritual bread is that women then distributed to health and deceased relatives. Believers seek the patronage of the Virgin Mary to life's problems. On this holiday to make family meetings associated with sacrifice - a sacrifice of life, health, fruitful year against mishaps and diseases. Traditional dishes on the table are fresh cake decorated with ornament, chicken porridge, boiled wheat, corn and pumpkin. Be sure to eat watermelon and grapes. Believers donate to the church candles, home-woven cloth, meat, cloth and money. According to legend, this is the day in which God's mother, 64 years old, left his earthly life and goes to his son. Three days before her death Archangel Gabriel announced to the Virgin Mary that God wanted to take her with him in his kingdom to reign forever with him. Her last wish is to see the Holy Apostles together. Miraculously they are carried at the door of her home in Jerusalem. Three days later Jesus Christ surrounded by angels and saints faces, coming down from heaven for the soul of the Virgin Mary. They buried her in a cave near Gethsemane and closed the entrance with stones. When a few days later it opened to bow before the saint belated apostle Thomas, found only her shroud. Becoming from the table, the apostles heard angelic singing and see the clouds most pure Mother of God, surrounded by angels who told them: "Rejoice, because I'm with you all the days." In memory of the appearance of the Virgin Mary before the apostles, the church sets on this day to celebrate liturgy and be done "exaltation of bread."